Tom challenged us to bring a track that was “the same song” as something on our album choice for our latest meeting; queue much pondering regarding what might constitute something being “the same song”; cover versions, remixes, live takes, Peel Sessions, re-recordings, reprises, songs that evolved into other songs. I thought about bringing Screamadelica and I’m Losing More Than I’ll Ever Have from Primal Scream’s previous album, to show where Loaded came from. We all thought about Tricky’s interpretation of Black Steel in the Hour of Chaos by Public Enemy. Rob mentioned the relationship between Tricky’s Overcome and Massive Attack’s Karmacoma. I thought about Red Sails from Lodger, which is essentially a track from Harmonia’s Deluxe (except that I’ve already played Deluxe at a previous meeting). I considered Sly and the Family Stone’s Higher from Dance to the Music, which was re-worked two years later into I Want to Take You Higher. This got me thinking about what makes a song, what the central essence of the art is; if with classical music the score is the essence, and if with jazz the live performance is the essence (Teo and Miles obviously obliterating this notion from 1969 onwards), then, with rock/pop, is the recording the essence? Apparently Boys Keep Swinging and Fantastic Voyage from Lodger both (very deliberately) have exactly the same chord sequence and structure, while Move On is the chords from All the Young Dudes played backwards! Then I thought about Kanye West rapping over Curtis Mayfield’s Move on Up, and the Jamaican Dancehall trend of MCs singing different ‘songs’ over the same backing tracks. I thought about The Stone Roses flipping the tape of Waterfall backwards, mumbling over the top of it, and pretending it was a new song. Then, after considering and discarding so many things, I looked at my pile of DRC potentials, and was struck by an album I’ve been meaning to bring since we started, which features an instrumental reprise of a song from a previous incarnation of the same group. Unsurprisingly, I’ve written about The Magical World of The Strands before, telling the stories behind its strange conception. Track six is a reprise of Undecided from Shack’s previous album, Waterpistol, and offers strange echoes of Mick and John Head’s past. 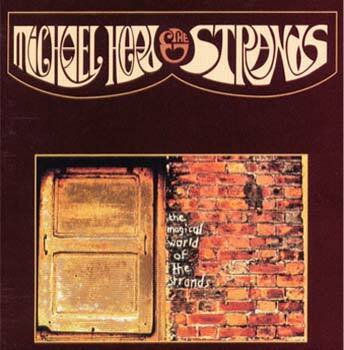 The Magical World of The Strands itself is a beautiful, strange record, in thrall to Arthur Lee’s Love, The Byrds, Nick Drake, The Beatles, and pastoral English folk music, yet somehow hermetically sealed from the world around it, a wistful, delicate, lovelorn universe of its own. It’s a damaged album made by a recovering heroin addict, which is nonetheless amazingly crafted and emotional. The songwriting on display is never less than exceptional, and, in Something Like You, reaches the kind of peak that very few composers of popular song can even comprehend, let alone achieve; it’s a near perfect love song. The Pale Fountains, Shack, The Strands, and then Shack again: Michael and John Head have tried time and again to break into the public consciousness and always been denied. It’s a shame, because this record is exceptional. Rob listened: I enjoyed parts of this, but, I dunno. I never really got the Shack as Great Lost Band thing. I saw them supporting The Fall in, I guess, the late 80s and they never really caught fire for me. I’ve given ‘HMS Fable’ a couple of goes over the years but… it’s all a bit meh. I found the sound of ‘The Magical World…’ really rather sweet, and the back story intriguing. Two or three of the songs really managed to nuture a lovely glow particlarly, if I recall correctly, the one John sings. However, I never really got Love either, I don’t get bands who set out to create pitch perfect recreations of bygone bands and sounds (and I could certainly picture one N. Gallagher nodding along appreciatively to this) and ultimately I didn’t get this, at least on first listen. Referential, reverential but not, i’m afraid, revelatory. Tom Listened: I have been keen to hear Shack related music for a long time now – I remember Uncut magazine going nuts (not Nuts magazine going uncut – that’s different!) for HMS Fable at the time of its release but The Magical World didn’t really do it for me – in fact my feelings towards this album very closely mirror Nick’s in relation to Satisfied Mind by The Walkabouts. A pleasant enough sounding album and possibly one that will reveal itself over time but, in direct contrast to Love’s Forever Changes (which it didn’t much resemble to be honest), it didn’t leave much of an impression on a first listen (for the record, I absolutely hated Forever Changes the first time I heard it, but it intrigued me nonetheless and went on to become a favourite album of mine).